By this point, you’ve probably already attended dozens of quinceañeras and have eagerly been awaiting your own. Now, as you begin planning for your special day, you realize just how much time, energy, and money goes into having the quinceañera of your dreams. The last thing you want to do is make easily-avoided mistakes that could make your special day into more of a headache than a fairytale. As your Top Rated Local® event hall in Katy, Alegria Gardens has hosted hundreds of quinceañeras — we have seen clients who do it all right, and those who struggle because of early planning decisions they didn’t think through. 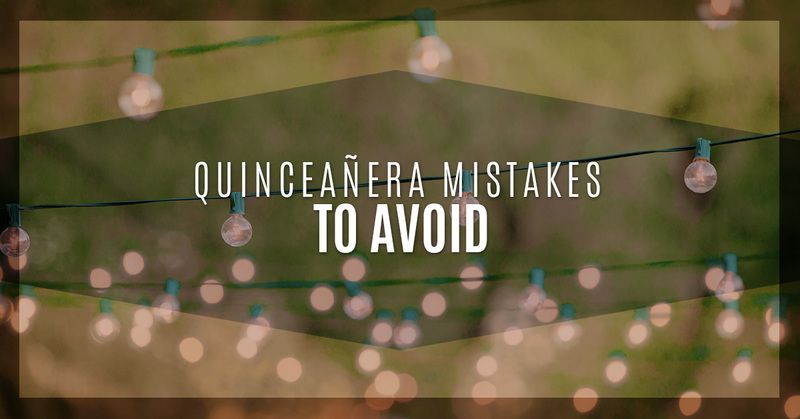 Here are the most common mistakes that women make as they plan their quinces. Of course your dress is going to be a focal point of the celebration, but that doesn’t mean it needs to be the first thing you buy. Instead, you should definitely have your party venue picked out before you choose your dress or even your theme. A beautiful party venue stands out on its own and has its own character. You want your theme and dress to work with the space, not clash. If a party hall is elegant and well-lit, you might want to steer away from a more casual theme like a beach or glow-in-the-dark one. Similarly, you might not want to get a bright pink dress if it will clash with the greens and blues of a venue. Get the place, and then worry about the dress. It is always better to provide too much information than to leave out important information that your guests need. Be very clear about dress code (including examples of appropriate outfits, even, if you think your guests might struggle in this department), timing, transportation to and from mass to the venue, and anything else you can think of. Additionally, you want to consider the time frame you have between your mass and reception. If you have an awkward amount of time, guests might not know what to do with themselves. Consider closing this gap or at least seeing if your party venue can host a pre-reception event before the big party. Even the best DJs might have a different taste in music than you. Your safest option is to make a playlist with your favorite songs and traditional quince songs. If you want to include popular line dances, like the Wobble, then be explicit and tell your DJ. The same goes if you do not want any group dancing. Remember to keep in mind that your quince will have guests from all different generations, so be sure to include some classics with your Ariana Grande favorites. Your toast is one of the most important parts of your special day. Think of it like a speech you’d give at the Academy Awards after winning an Oscar. You can tell the actors who haven’t prepared — the ramble on, they mumble, they forget to thank important people, and they generally seem frazzled. You want to be confident. After all, the whole celebration is about your entrance into adulthood and responsibility. Practicing is a good idea, but try not to just read from your script. Know what you want to say, and then present it naturally when you give the toast. For one less thing to worry about as you plan your quinceañera, get an amazing venue as soon as you can. Alegria Gardens is your Top Rated Local® event hall in Katy, and countless young women have chosen us as their party venue. Contact us today to learn more about our special quinceañera event package.